Common glove materials are listed in this chart. Encourage employees to measure their hands using a sizing chart. 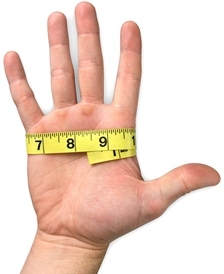 To determine the proper glove size, use a soft cloth tape measure to measure your dominant hand as in the image below.